The state of Goa is one of the hottest beach destinations in India. Situated along the western coast of the country, the state has become very popular as a tropical getaway for tourists. Famous for its extensive beaches, the state also has a diverse and rich history which has left its mark in the numerous historical sites that are scattered all over the place. Last but not the least, much of Goa happens to be located right along the Western Ghats, making it abundant when it comes to greenery and nature. The eastern part of Goa, in particular, happens to be a very hilly area and much of it is covered by tropical rainforests. Due to its popularity as a beach destination, one will find plenty of choices when it comes to finding great accommodations. 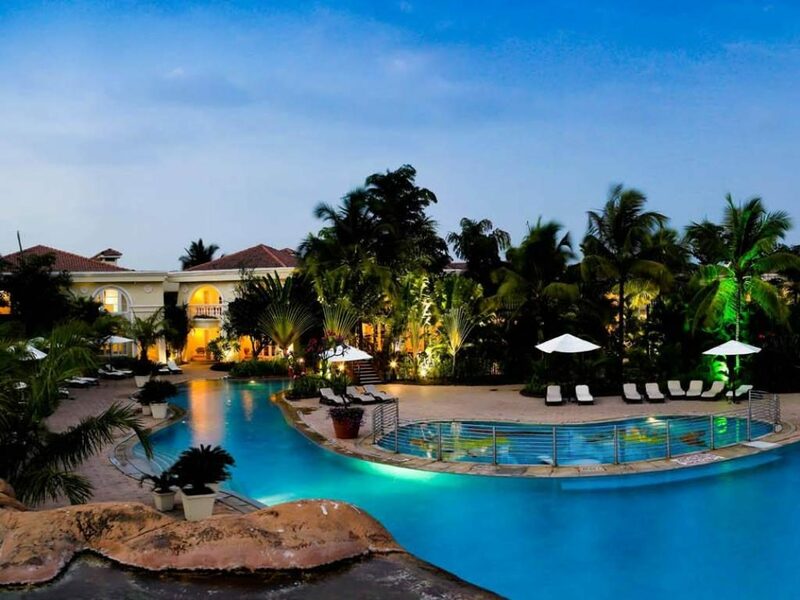 Mentioned below on the list are some excellent 5-star hotels to choose from in South Goa. Caravela Beach resort is an excellent seaside stay located in Varca. It is one of the most luxurious stays in the entire region and happens to be one of Goa’s very first international beach resorts. Built on 24 acres of lush landscape, it offers comfortable and well-furnished rooms to its guests, which have all the major conveniences and facilities. In addition to this, the place has been designed using amazing architectural designs, much of which is derived from the bygone colonial times. Added to this are touches of modernist elements that brilliantly complement the bigger picture. Apart from this, the resort is located very close to the beach, with the seaside being a short walk away from its premises. The facilities that are available include Pool, Room Service, Free Parking, Fitness Centre with Gym / Workout Room, Beachfront, Restaurant, Spa, Bar/Lounge, Breakfast included, Room Service, Free Parking, Business Centre with Internet Access, Children Activities (Kid / Family Friendly), Airport Transportation, Breakfast included, Dry Cleaning, Meeting Rooms, Laundry Service, Concierge, Banquet Room, Multilingual Staff, Conference Facilities, Babysitting, Breakfast Available, Air Conditioning, Refrigerator in room, Minibar, etc. 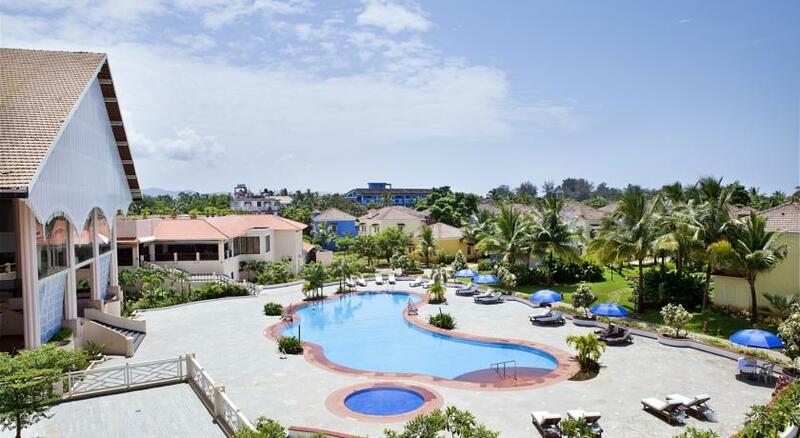 The Diwa Club is an excellent luxury resort located in Majorda. Designed using elements from traditionalist architectural themes, the resort provides guests with an excellent ambience and atmosphere. In addition to this, the place also has brilliantly designed rooms with plenty of conveniences and facilities. Apart from this, the resort is located very close to the beach, with the seashore located just a short distance away. The Starting prices for rooms begin at Rs 9, 900. The facilities that are available include Pool, Room Service, Free Parking, Restaurant, Bar/Lounge, Spa, Breakfast included, Fitness Centre with Gym / Workout Room, Free High Speed Internet ( WiFi ), Children Activities (Kid / Family Friendly), Shuttle Bus Service, Room Service, Free Parking, Airport Transportation, Breakfast included, Dry Cleaning, Meeting Rooms, Business Centre with Internet Access, Laundry Service, Concierge, Banquet Room, Conference Facilities, Babysitting, Multilingual Staff, Air Conditioning, Minibar, etc. 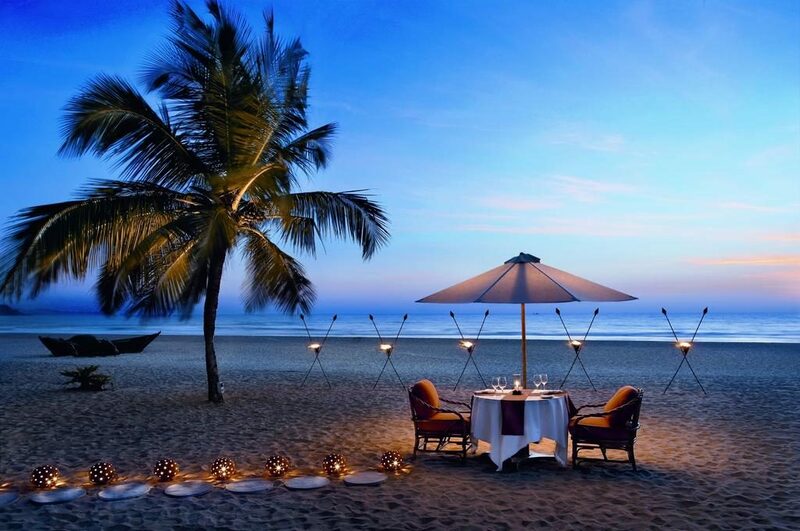 Taj Exotica is an amazing luxury resort located in South Goa, in the town of Benaulim. Situated very close to the popular Benaulim beach, it offers amazing facilities and other conveniences to all its guests. The beach itself is just a stone’s throw away from the premises. In fact, one can actually observe the beach from the resort itself. 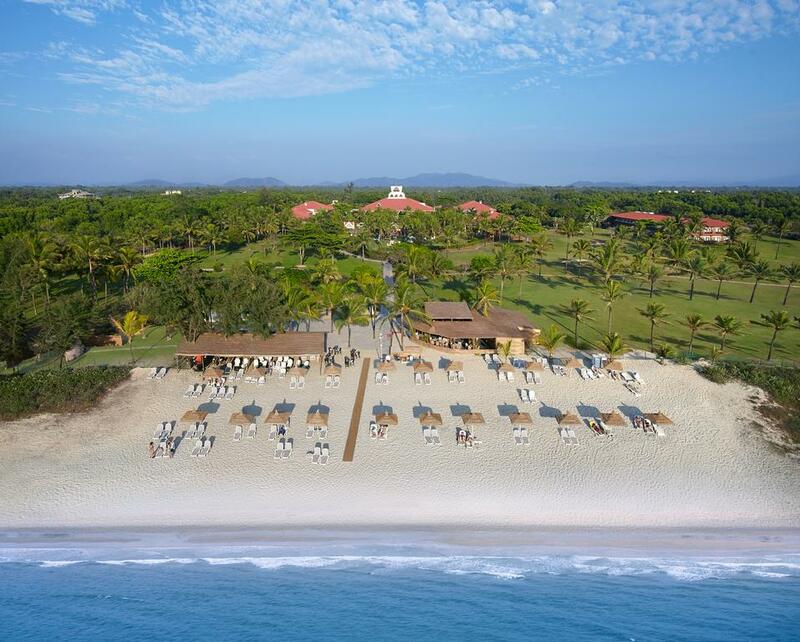 With regard to the architectural design, the predominant element used for the resort is that of traditionalist themes, particularly from the times when Goa was ruled by Portugal. In addition to this, one can also find modernist elements that blend harmoniously with the rest of the resort. Last but not the least, the resort is very close to the beach, with the seashore located a short walk away. The beach and the Arabian Sea can actually be viewed from the premises of the resort. The Starting prices for rooms begin at Rs 13, 500. The facilities that are available include Pool, Free Parking, Fitness Centre with Gym / Workout Room, Room Service, Restaurant, Beachfront, Bar/Lounge, Spa, Breakfast included, Free High Speed Internet ( WiFi ), Free Parking, Business Centre with Internet Access, Room Service, Meeting Rooms, Children Activities (Kid / Family Friendly), Shuttle Bus Service, Dry Cleaning, Laundry Service, Concierge, Banquet Room, Babysitting, Breakfast included, Multilingual Staff, Conference Facilities, Airport Transportation, etc. 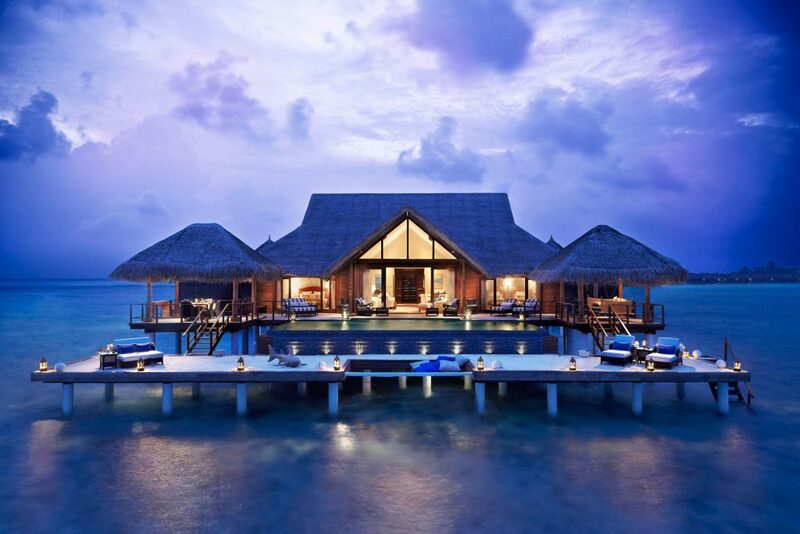 The Alila Diwa is an excellent five-star resort located at Majorda beach. Situated very near to the seashore, it is an excellent place to stay at while holidaying in this part of Goa. In fact, the beach is actually just a short walk away from the resort, well within walking distance. In addition to this, the resort has some of the best facilities in terms of comfort and features, making one’s stay all the more memorable. With regard to the architecture used at the resort, the place is for the most part based on the traditional designs of Goa, particularly from colonial times. In addition to this, the place also has an abundance of greenery all around it. The Starting prices for rooms begin at Rs 8, 100. The facilities that are available include Pool, Room Service, Restaurant, Bar/Lounge, Spa, Fitness Centre with Gym / Workout Room, Free Parking, Breakfast included, Free High Speed Internet ( WiFi ), Room Service, Children Activities (Kid / Family Friendly), Shuttle Bus Service, Free Parking, Airport Transportation, Breakfast included, Dry Cleaning, Meeting Rooms, Business Centre with Internet Access, Laundry Service, Concierge, Banquet Room, Multilingual Staff, Conference Facilities, Babysitting, Breakfast Available, Air Conditioning, Minibar, etc. 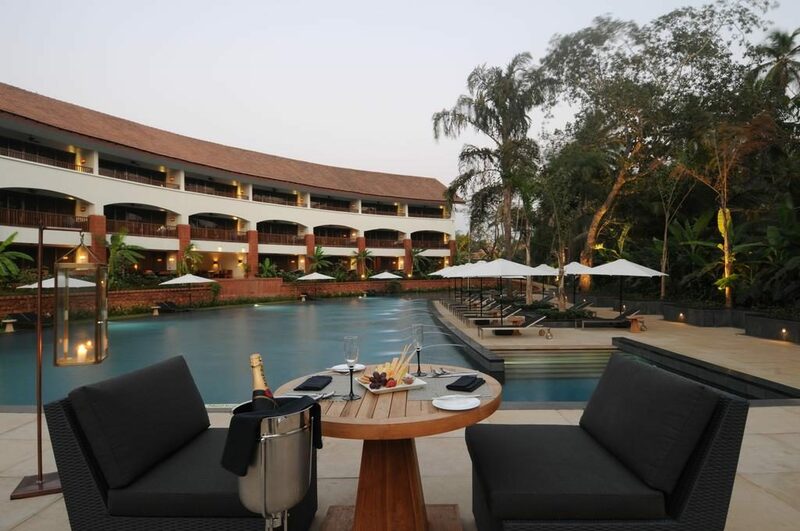 The Leela Hotel is an excellent five-star stay in the town of Cavelossim. Located very near to the popular Cavelossim beach, it is an excellent place to stay at in this part of Goa. As with any other hotel bearing the name of Leela, this place is no different. Guests can look forward to plenty of amazing amenities and facilities. Coming to the architecture of the place, the resort has been designed using the best in trends, based on a mix of traditional and modernist elements. In addition to this, the place is situated in the middle of a great deal of greenery. In addition to this, the place also has well-landscaped gardens as well as lovely coconut groves, all of which together create an amazing tropical environment. The Starting prices for rooms begin at Rs 14, 800. The facilities that are available include Pool, Room Service, Free Parking, Restaurant, Fitness Centre with Gym / Workout Room, Beachfront, Bar/Lounge, Spa, Free Internet, Business Centre with Internet Access, Room Service, Free Parking, Meeting Rooms, Children Activities (Kid / Family Friendly), Airport Transportation, Dry Cleaning, Laundry Service, Concierge, Banquet Room, Conference Facilities, Multilingual Staff, Babysitting, Air Conditioning, Minibar, etc. 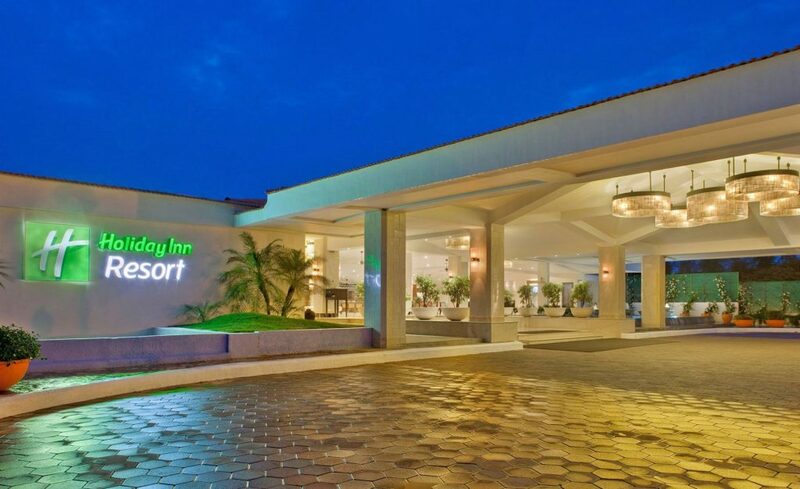 The Holiday Inn is an excellent luxury stay located in Cavelossim. Situated very near to the popular Cavelossim beach, the resort provides a most amazing stay with all major amenities and features to its guests. The resort has been designed using a mix of traditional and modernist elements. Of this, the main influence that is observed is a predominance of the traditional element, particularly from the colonial times. The rooms at the resort are well designed and furnished, with all modern conveniences necessary for a memorable stay. Last but not the least, the beach is well within walking distance. Guests can in fact actually view the entire beach and the Arabian Sea from within the resort premises. The Starting prices for rooms begin at Rs 7, 300. The facilities that are available include Pool, Room Service, Restaurant, Fitness Centre with Gym / Workout Room, Beachfront, Free Parking, Bar/Lounge, Spa, Free Internet, Business Centre with Internet Access, Room Service, Free Parking, Dry Cleaning, Meeting Rooms, Laundry Service, Concierge, Banquet Room, Conference Facilities, Airport Transportation, Babysitting, Multilingual Staff, etc. 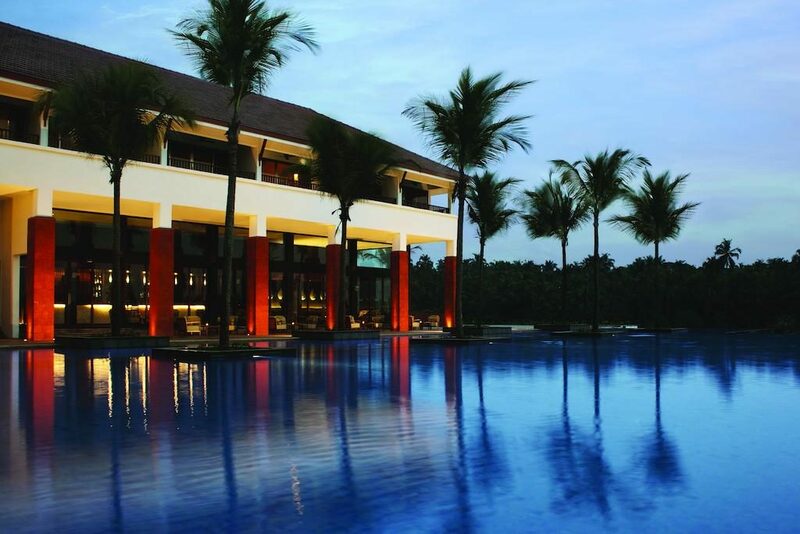 The Zuri White Sands Goa Resort and Casino is an amazing five star luxury stay in Goa, located in the town of Varca. The resort is located adjacent to the popular Varca beach and provides guests with all the latest amenities and features. Architecturally, it is largely based on traditional Goan elements, along with several other traditionalist influences. With regard to the rooms at the resort, guests can look forward to all major modern conveniences. Last but not the least, the resort is within walking distance from the beach, with the shore visible from within its premises. The facilities that are available include Pool, Free Parking, Fitness Centre with Gym / Workout Room, Restaurant, Room Service, Beachfront, Spa, Bar/Lounge, Breakfast included, Free High Speed Internet ( WiFi ), Free Parking, Business Centre with Internet Access, Room Service, Children Activities (Kid / Family Friendly), Airport Transportation, Breakfast included, Dry Cleaning, Meeting Rooms, Laundry Service, Concierge, Banquet Room, Multilingual Staff, Conference Facilities, Babysitting, Air Conditioning, etc. The Radisson Blue is an excellent resort situated in the town of Cavelossim. Located very near to the popular Cavelossim beach, it is an excellent choice for those who plan to visit this part of the state. The resort has been designed largely using traditional Goan elements. Furthermore, the entire place is surrounded by well-landscaped gardens and lawns. Also, the beach is very near to the resort, located approximately about a block away from the seashore. The beach can be reached within a few minutes by walk. The Starting prices for rooms begin at Rs 6, 700. The facilities that are available include Pool, Free Parking, Fitness Centre with Gym / Workout Room, Beachfront, Room Service, Restaurant, Bar/Lounge, Spa, Free High Speed Internet ( WiFi ), Breakfast included, Free Parking, Business Centre with Internet Access, Children Activities (Kid / Family Friendly), Room Service, Airport Transportation, Dry Cleaning, Meeting Rooms, Laundry Service, Concierge, Banquet Room, Multilingual Staff, Conference Facilities, Babysitting, Breakfast included, Air Conditioning, Minibar, etc.